Nashville’s hottest Australian country artist Morgan Evans is set to continue his non-stop touring calendar with a European and UK tour this September. 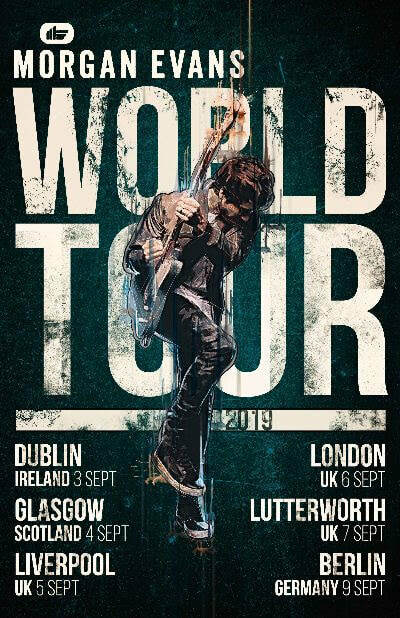 He will be bringing his charismatic performance and impressive one-man-band setup overseas, kickstarting things in Dublin, before stopping through Glasgow, Liverpool and London. He will then be finishing things off with a slot at Leicestershire’s Country, Americana and Roots Festival, The Long Road. The Warner Music Nashville / Warner Bros. Records award-winner has been forging his path as one of the genre’s up-and-coming stars, with his debut US single ‘Kiss Somebody’ hitting #1 at US Country Radio while claiming Country Work of the Year at the 2018 APRA Music Awards. His follow-up hit ‘Day Drunk’ spent an astonishing 25 consecutive weeks at #1 on the TMN Country Airplay chart and 2 weeks at #1 on the TMN Hot 100 airplay chart — making Evans the first Country artist to achieve this feat since 2009 when Taylor Swift reached the top of the chart with ‘Love Story’. Adding to the international impact, the song has been awarded Single of the Year at Australia’s Golden Guitar Awards. The tracks are featured on his latest album and major label debut Things That We Drink To, alongside his collaboration with his wife Kelsea Ballerini on ‘Dance With Me’, and sees Evans continue his rise to international stardom. He has been travelling the world in celebration of the release, touring with the likes of Dan + Shay, Chris Young and Old Dominion as well as his own sold out headline runs. Highly praised by the likes of Rolling Stone, CMT, SiriusXM, Billboard, Maverick, PEOPLE and MusicRow, Evans was also chosen to DJ on BBC Radio 2, presenting highlights from the 2018 CMA Fest over four weeks. Evans’ stellar musicianship and upbeat tracks have been winning over UK music fans who have been eagerly awaiting his return. Pre-sale tickets for his UK September tour go on sale on March 29th.